The Rawson Properties Brackenfell Roslyn franchise was able to sell more than 350 properties in 2012 – this making it the top residential franchise in the Western Cape and no. 2 nationally in the Rawson Property Group – a position (or similar) they have held for some two years now. One reason for this success, says Andre Swart, Rawson Properties franchisee for Brackenfell Roslyn and Kraaifontein Brighton, is that these regions are front-runners in the Western Cape for new developments. No other Cape precinct, he says, is seeing as much new development as his areas and almost all of these are at very reasonable prices – which are highly attractive to investors. A high percentage of these projects, he adds, are in security villages and most have sold out within six to 12 months to date. Rubernet in Brackenfell. This development is made up of 28 three bedroom, duplex, face brick façade apartments priced from R760,000. Each has one and a half bathrooms and a lock-up garage. The units are sold on a plot-and-plan basis and are now being handed over at a rate of three per month. The project is likely to be sold out well before the end of 2013. Othello Retirement Village. Here there are 70 apartments, half of which are still available. They are in three storey blocks which offer views of Table Mountain and the Hottentots Holland. Prices range from R674,000 to R699,000, inclusive of transfer fees. Residents are accepted from the age of 50 and once they have taken occupation they are expected to pay a monthly levy of just R1,000 per month. This levy entitles them to certain free meals and other advantages, as well as freeing them from any maintenance or upkeep costs. The development has its own dining room, ladies bar, laundry, exceptionally high security, an aftercare health centre with full nursing care provided by Elcare and doctors’ rooms that offer regular visits to residents. Trinity turnkey development in Sonkring, Brackenfell. This development consists of 27 freestanding homes, two phases of which are already complete. The remaining 20 homes are being sold by Rawson Properties on a turnkey basis with prices pitched from R 1 365,000. A group housing scheme is now also being planned for the site. 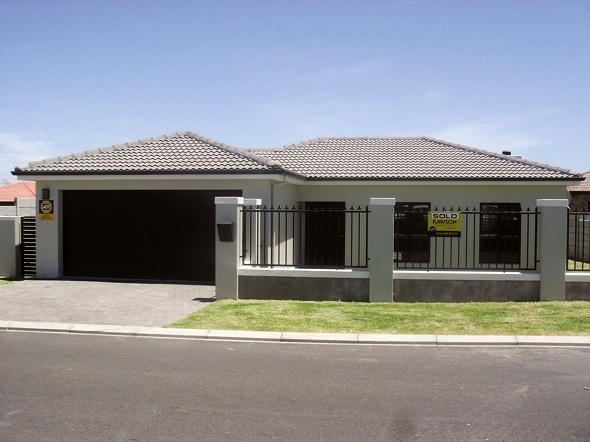 Front view of a completed home at the Trinity turnkey development in Sonkring, Brackenfell. Buh-Rein Estate in Kraaifontein. This innovative, highly affordable scheme consists of three types of freestanding homes, all in attractive Cape vernacular styles. They are sold on a plot-and-plan basis and they vary in size from 83 m2 to 100 m2 and in price from R739,900 to R819,900. The homes have two or three bedrooms and all come with a single garage. The developers are currently in the first phase of a scheme that is likely to be on-going for some five years as the site covers 88 ha altogether. In this first phase, most of the 39 units will be sold and completed by mid-2013. Kaelyn Close at Protea Heights. This, too, is sold on a plot-and-plan basis. This development offers single storey homes with mono pitched roofs, again in an attractive Cape vernacular style. Each unit has two or three bedrooms with the option of single or double garages. There will be 25 homes in all and prices start from R904,000. Rawson Properties have a sole mandate here and to date, says the local Rawson agent, Tom van Wyk, ten units have been sold, leaving a further 15 to be sold. Viking Village in Kraaifontein. This is a new development of 16 single storey homes which can be bought with either a plaster or face brick façade. They are all free standing and all have either two or three bedrooms and double garages. At R675,000, this, says Andre Claasen, one of Rawson’s agents on the project, is probably the best value that any scheme in the Western Cape currently offers. Swart says that the affordable prices in his area will ensure that demand, already very strong, continues to increase. However, he says, the big ‘break’ on sales is the fact that so many of the buyers here come to the market with limited savings and are looking for 100% bonds – for which a fairly high percentage do not qualify, on account of poor credit and other records. To help overcome this situation, Swart sometime back recruited his own bond originator Esme le Roux and she has been achieving up to 25 successful bond applications every month, a success rate of over 80%, which is well above the national average.